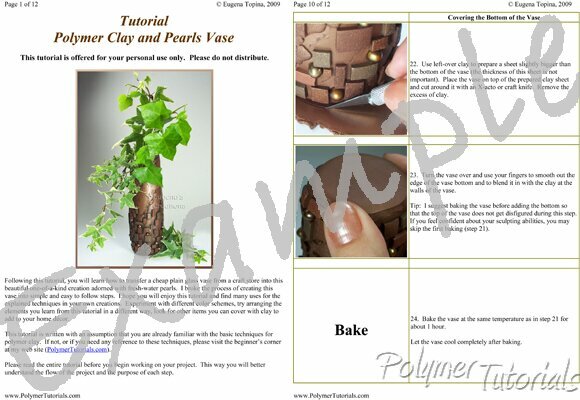 Following this polymer clay tutorial, you will learn how to transfer a cheap plain-looking glass vase from a craft store into this beautiful one-of-a-kind creation adorned with fresh-water pearls. I broke the process of creating this vase into simple and easy to follow steps. There are twelve pages of instructions and almost thirty full-color pictures that thoroughly explain this project. I strongly recommend using Kato polymer clay for this project, although I've also included instructions that would help you get a similar design with other brands of clay. The first three pictures on this page show the vase described in this tutorial. The last picture shows a similar vase made using the techniques explained in this tutorial. Place a mouse over the small pictures to see them enlarged. Your tutorial is very interesting! Very well explained and p ..